Aviation officials Thursday (September 25, 2014) for the first time approved the use of unmanned aircraft for commercial filming in the United States, opening the door to what is expected to be a slow-building gold rush to the skies. Six companies received exemptions from the existing rules, which generally ban the commercial use of unmanned aerial systems or UAS. The exemptions were granted to RC Pro Productions Consulting LLC dba Vortex Aerial, Aerial MOB LLC, Astraeus Aeria, HeliVideo Productions LLC, Pictorvision Inc., and Snaproll Media LLC. The firms were part of a group of seven that coordinated their applications and submitted them together May 27 — becoming the first firms to apply. The application of a seventh firm, Flying-Cam Aerial Systems, is still pending. The companies will use certified pilots to maneuver small aircraft within the highly controlled confines of film sets. The six are currently prohibited from operating at night although that could change pending future discussions. A point that probably helped the petitioners was that the unmanned craft would likely replace full-sized helicopters now used for some filming tasks. The FAA was weighing the trade-offs in terms of safety and cost “versus what [the film companies are] doing now with helicopters,” said Mark Dombroff, a partner at the law firm of McKenna Long & Aldridge LLP, which has a specialty in unmanned law. Another factor was the risk of “off-shoring,” the sending of work overseas, which has afflicted Hollywood in recent years. The current restrictions are “driving a lot of the filmmaking activities that would otherwise use drones out of the United States to other countries,” Dombroff said. The firms filed their requests under Section 333 of the FAA Modernization and Reform Act of 2012 — a provision that allows the FAA to approve uses it considers safe while it works out broader rules for unmanned aerial systems or UAS. Those rules are expected to emerge in stages with the first set for smaller UAS being published for comment later this year. In the meantime Huerta said that the FAA would publish a guide on how to file for a Section 333 exemption. 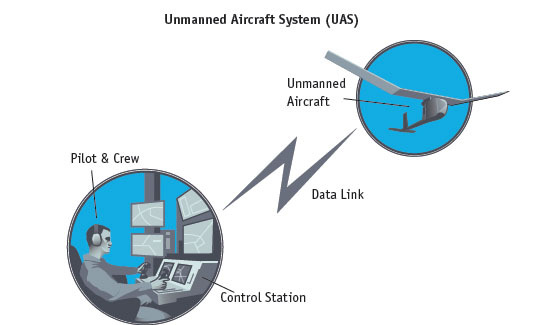 The exemption announcement came just days after the inspector general at the U.S. Department of Transportation (DoT) announced a new audit of the Next Generation Air Transportation System (NextGen) — a new air traffic management network that relies heavily on GNSS services and may be crucial for enabling larger unmanned aircraft to operate in U.S. skies. But questions persist about the future of NextGen as costs escalate and slow progress in implementing needed ground improvements frustrate users. Calvin Scovel, the Department of Transportation’s Inspector General told Congress earlier this year that the cost for the system could triple to $120 billion and require an additional decade to finish — potentially pushing completion of the project back to 2035. The FAA has six “transformational programs” essential to the success of NextGen: Automatic Dependent Surveillance-Broadcast (ADS-B), System-Wide Information Management, Data Communications, National Airspace System Voice System, Common Support Services-Weather, and the Collaborative Air Traffic Management Technologies. The agency has invested nearly $3 billion in these programs and is requesting an additional $488 million for fiscal year 2015, said the DoT’s Assistant Inspector General for Aviation Audits Matthew Hampton in a September 22 letter.